What can Madico Solar Control Window film do for me? -Madico’s line of Commercial and Residential films contain highly specialized, multiple layers of vacuum deposited metal, engineered to reject up to 80% of the sun’s costly, unwanted heat gain. -Stopping the sun’s heat at the glass surface can lower a room’s temperature, near the window, by 10-15⁰. -The savings equate to one ton of air conditioning for every 70 sq. ft. of sun exposed glass. Now that’s performance! -Air conditioning is used less so utility costs are reduced. -Because air conditioning is used fewer hours per day and fewer days per year, HVAC units last longer and require less maintenance. -This product can actually pay for itself in energy savings, in as little as 2 to 3 years! Ultra Violet light is the single largest cause of fading and deterioran of your interiors; ie. the carpets, wood floors, drapes, furniture, and art work. UV light accounts for 40% of fading. The other main culprits are visible light (25%) and heat (25%). All Madico films, including those that are clear, screen out 99% of the UV. If you add a film that also reduces excess light and heat, you have just added years of life to your interiors. Replacing wood floors, carpet, furniture or expensive window coverings in just one room will probably be a greater expense than adding a protective, solar control film to your entire house. The bright sun, beaming through your windows onto computer screens, cash registers, TV’s, and projection screens can be reduced to a comfortable level. The darker the film, the more harsh light or “glare” that is reduced. 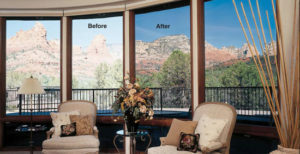 Darker or more reflective window films can give you daytime privacy. Drapes and shades can be left open and nosey neighbors can no longer see in, yet you can still see them. Film can add a new, modern look to an old building. Older buildings take on a more modern, uniform appearance. Even for newer structures, it can disguise the “hodge podge” of open and closed blinds or shades. All Madico window films will increase a level of safety. Applied to the inside surface of the window, it will hold broken glass together in case of accidents, weather, vandalism etc. Heavier gauge films are designed specifically for increased safety and security from violent weather, explosions, terrorism and illegal entry. To learn more about safety and security benefits, see our Safety Films page. Even though film is not considered a winter insulating product, it does offer some benefits. Some of the man-made heat (ie. from a furnace) are bounced back into the room, by the film. Window film will also even out the sun’s heat during cold months, by eliminating “hot spots” . Yes, the film will filter out some of the welcomed solar heat, however, the amount of heat gain from the sun, lost during the day (in dollars) is equal to the amount of man-made heat reflected back into the building at night. Remember, you still have fading and increased glare, in the Winter. The nomenclature number represents the visible light transmission (VLT) or the amount of light that passes, then the lower the number, the darker the film. Darker films reduce more glare and heat. Our films are identified by a series of abbreviated letters and numbers. The nomenclature number usually represents the Visible Light Transmission (VLT) or the amount of light or glare that passes through the film. The lower the number, the darker the film. In most cases the lower the number, the more heat that is reflected, as well. Go to Madico.com for more technical information and specific data for each film. What other window coverings have these benefits? Allows your window to function the way it is designed. Allow visibility out, let light in and control the outside elements.